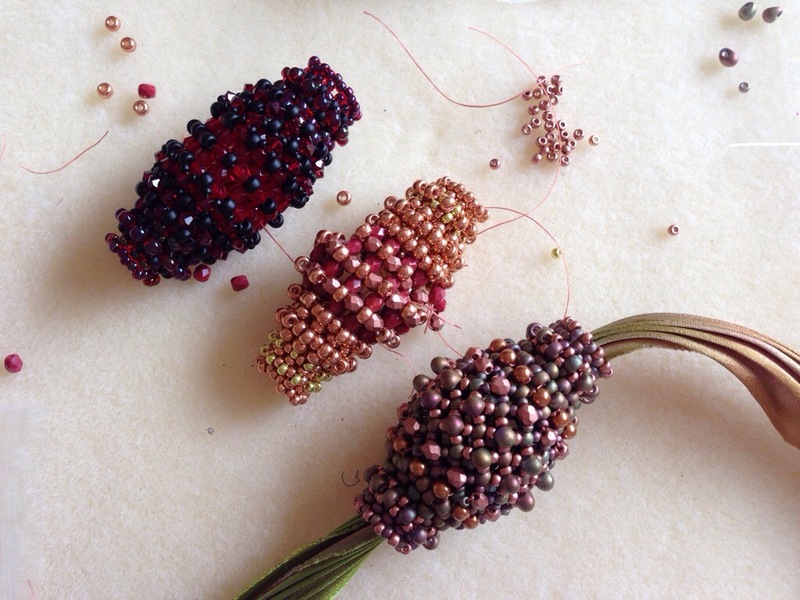 I love Sabine Lippert‘s work – the techniques she uses are incredibly clever but often simple to bead, and the results are wonderfully exuberant, beadtastic pieces. 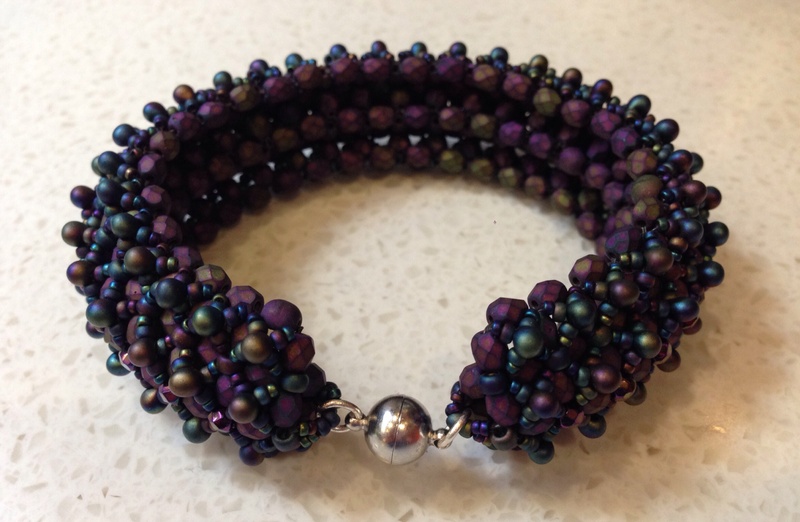 When she created her Rizo beads a while back I bought a copy of her Curizo design so that I could use them in the way she’d intended, and I fell in love with it. So much that I made another, and then when I needed to put something together in a hurry for a wedding this weekend, another. 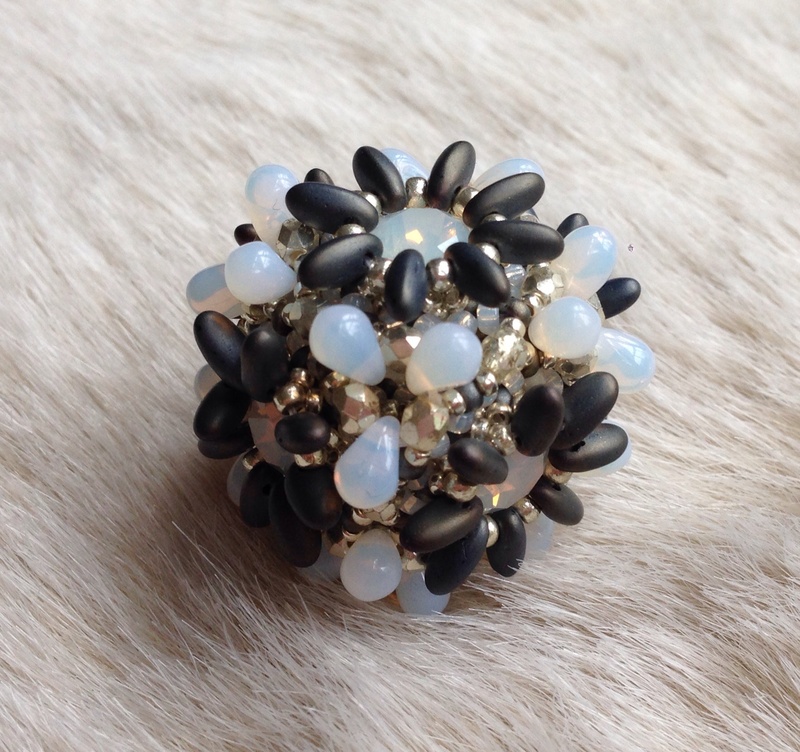 They’re quick to bead – 3-4 hours for me, and use my current bead binge favourite chatons. And I love them, and other people love them (although the smallest boy sadly loves them so much that he bust the chain on the white one last week). Turquoise – Opaque turquoise rizos, opaque olive 3mm fire polished, crystal AB Swarovski chatons and 3mm bicones, silver duracoat miyuki seeds. White – Opaque matte white rizos, opaque lime 3mm fire polished, sunflower Swarovski chatons and 3mm bicones, silver duracoat miyuki seeds. Grey and Opal – Brown Iris Matte rizos, silver 3mm fire polished, white opal Swarovski chatons, white opal czech small teardrop beads. 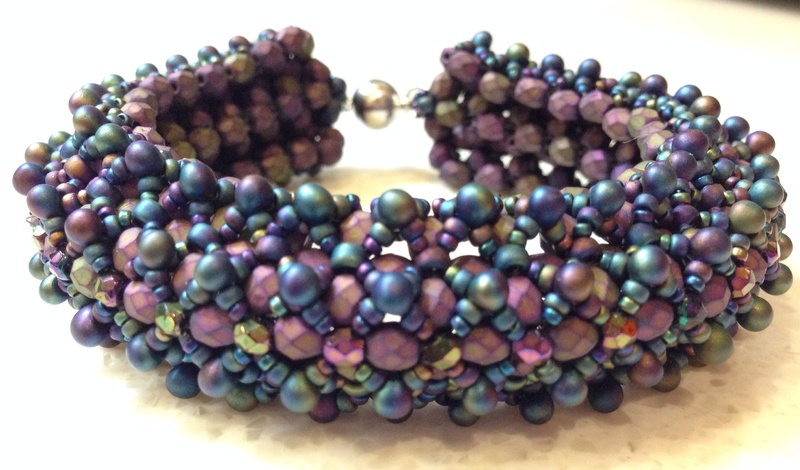 I don’t have many tips for this one, it’s really very lovely to bead and works perfectly. I quite like to thread the chain or cord through the whole finished piece (as I did with the white and lime version), although that then leaves you with quite a short piece. For the grey and opal version and the original turquoise I’ve added a loop – the former needs to go with a specific dress with quite a low neckline, so long was the only option. If you’d like some matching earrings like my turquoise ones, simply complete the flower shape and capture the chaton, then add a loop to hang. For the final version, in the step where you would add fire polished beads and crystals I simply used fire polished, and then in the final joins I put Czech drops where the fire polished would have been. 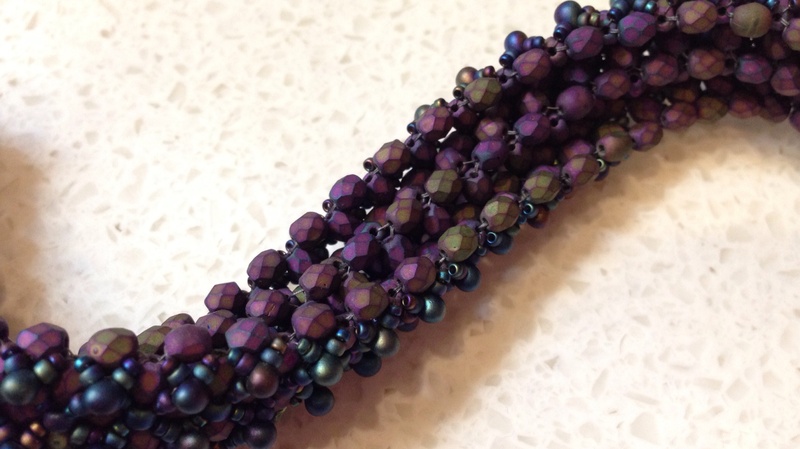 I did this because I didn’t have any 3mm bicones in the right colour (and have bought far too many beads lately so didn’t want to buy any more). On reflection the drops don’t really go with the rizos I used, and the cube shape is more visible (the others look more like a ball which is easier to wear), so I wouldn’t necessarily recommend this variation. Some lovely Heliotrope chatons have just arrived from the States, and I’ve got some fab neon Rizos (Robin’s Beads), and neon fire polished beads (More Beads 4 U – Etsy) – quite a flambouyant Curizo this time.